On a Windows 10 system with an AMD Radeon GPU and an Intel GPU (desktop or notebook), with graphics drivers installed for both GPUs, I bet you will see that OpenCL is limited to the AMD GPU only. 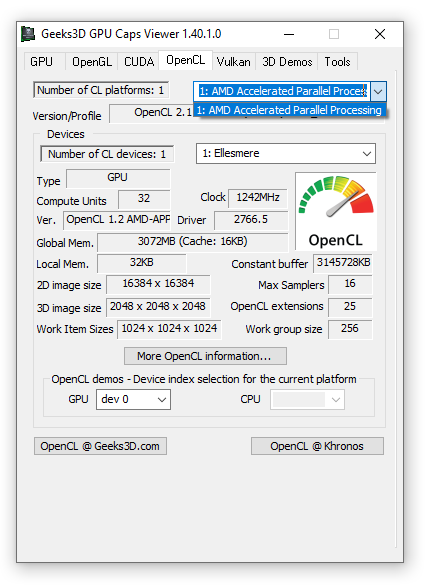 If you search for Intel OpenCL related files with Explorer or Regedit, you will quickly find that all OpenCL driver files are there. 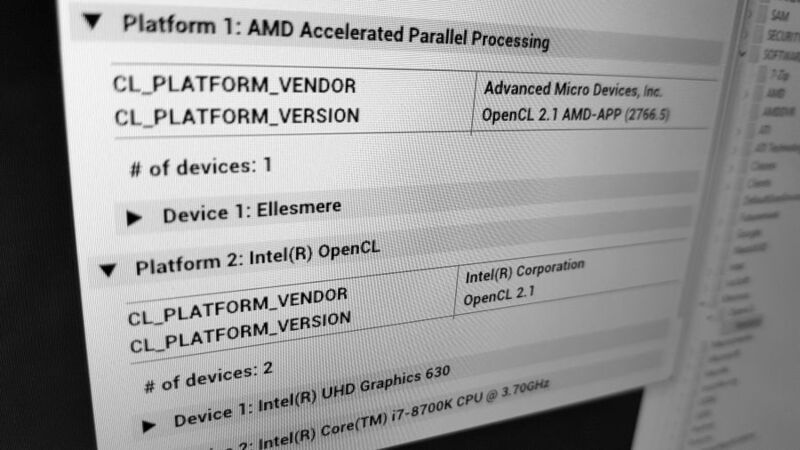 So why is Intel OpenCL support disabled when an AMD Radeon GPU is present? Sorry, I don’t have the answer. Probably a savory story of drivers (AMD?). 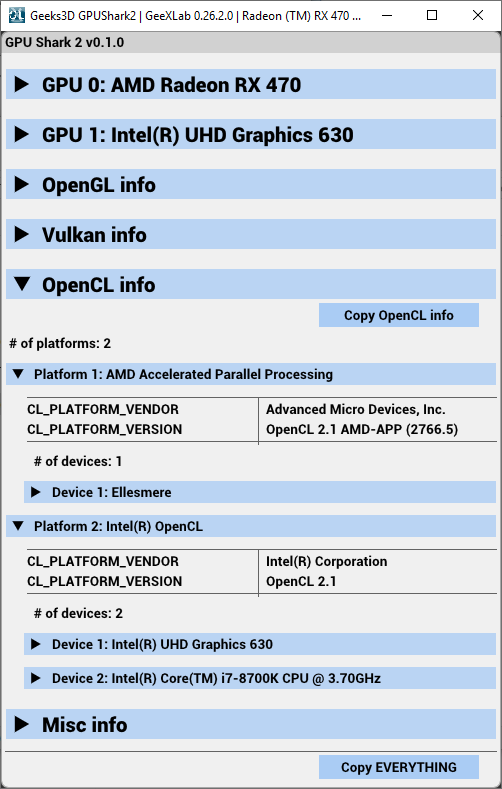 But here is a way to enable the Intel OpenCL support on Windows 32-bit and 64-bit with a simple registry tweak. 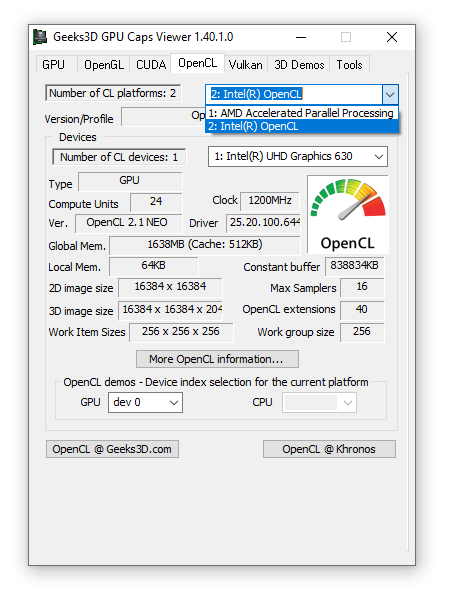 Here is the tweak to enable OpenCL support for Intel processors. 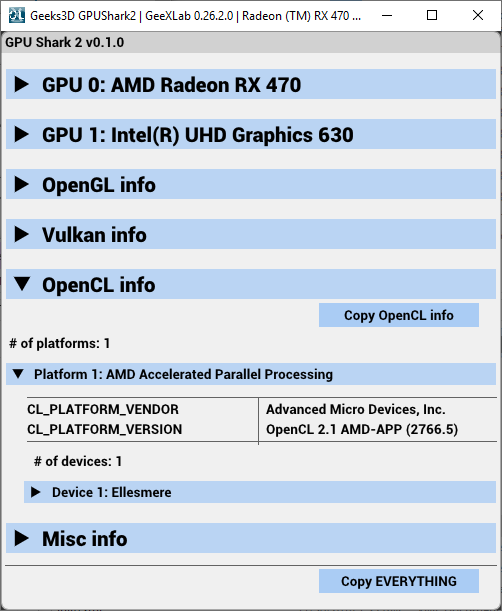 The OpenCL ICD (Installable Client Driver, the OpenCL.dll shipped with the graphics driver) tries to load all OpenCL implementations described in the HKEY_LOCAL_MACHINE\SOFTWARE\Khronos\OpenCL\Vendors key (64-bit app on Win64 or 32-bit app on WIn32) of the registry. For 32-bit apps on Windows 64-bit, the key is: KEY_LOCAL_MACHINE\SOFTWARE\WOW6432Node\Khronos\OpenCL\Vendors. Here are the right values for both keys. 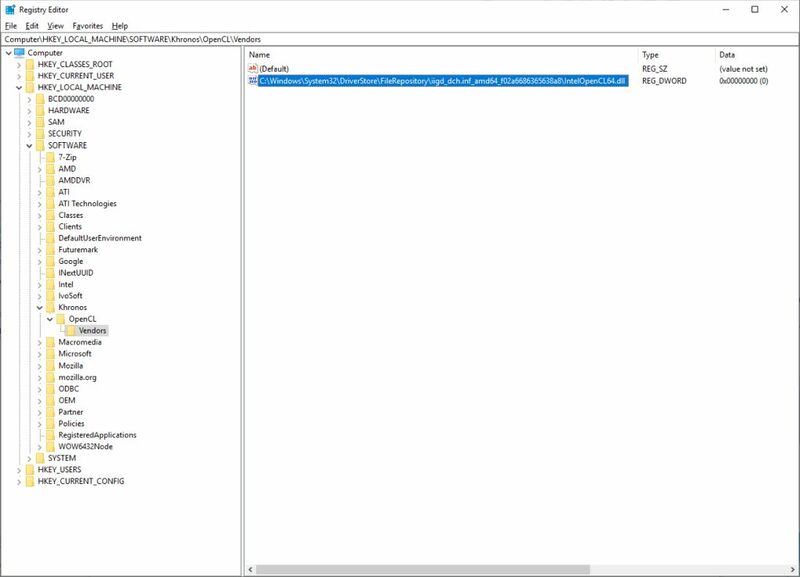 These values properly enabled OpenCL for Intel CPU/GPU on my test system when AMD Adrenalin 18.12.3 driver was already installed. Remark 1: on a system with no AMD GPU, these tweaks are useless, because Intel OpenCL support is properly enabled after Intel driver installation.